Hi there! I’m Michelle Bird, a foster parent for UMDR. I’ve been asked to guest blog this month which is both scary and an honor. For those of you who don’t know me, I have been fostering and volunteering with UMDR since 2008/2009. My first foster for UMDR was a beautiful brindle pitbull named Meg who came to us from an outdoor pen. Since that time, I have fostered just about any type of dog with UMDR. I’ve had everything from puppies to seniors, bloodhounds, pitbulls, labs, shepherds, even a few of unknown origin/breed, happy go lucky pups and those who needed a little extra in the training department. In all that time, I have expected each of my UMDR fosters to go on to an adoptive home and continued their lives without me. It is hard to let fosters go at first, but it gets easier over time when you see the impact they have on their new home. "Forever Foster” is a term we use to describe dogs we are reasonably sure will never leave the care of UMDR. Sometimes these dogs are too fearful of new situations, some have behavioral quirks that make them unadoptable, some have health issues, some have aged past the point of being considered by families looking to adopt, and some have all of the above. UMDR commits to every dog taken into our rescue for life. We rescue dogs based on their situation, not their breed. Because of this, we end up with a variety of breeds, including those that have stipulations on where they can live. When we pull a dog from a bad situation, we never know what type of issues we will be dealing with. Luckily, we are fortunate to have a wonderful trainer who helps with behavioral issues, wonderful foster homes who provide safe spaces for our dogs to heal from both physical and mental ailments, and veterinary support when issues arise. Because of our rescue policy, we tend to have a few forever fosters at any given time. UMDR uses a lot of resources for these dogs over their life spans, but we feel compelled to give every dog we rescue a good life, no matter the cost. Because we know most of these dogs will not be adopted, we continue to fundraise for all of their expenses from preventive care to hospice. Reba’s journey has been an interesting one. 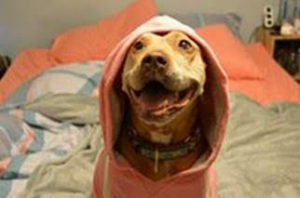 Reba is a 14 year old red pit bull that has been with UMDR since April 24, 2012. Before that, Reba and another dog were outside on a chain. UMDR attempted to work with her owners to relinquish her before they were to be evicted from a trailer park that was closing in Columbia. Instead, when the park closed, Reba and another dog were left behind to fend for themselves. Animal Control seized both dogs and took them to the local animal shelter. While at the shelter, we learned that Reba has aggression with other animals. UMDR reached out to Animal control and we took both dogs into rescue. Upon evaluation, we discovered that Reba had most likely been used in a repetitive breeding situation with possible dogfighting experience. Her teeth were worn down and damaged. (We affectionately refer to her as the one tooth wonder.) Reba has a homemade tattoo with the year 2003 which is how we know how old she is. Upon intake, Reba was sent to a foster home and training. Reba made strides in her foster home and was eventually sent to our rehab facility when the foster home moved. Over time, we were able to reduce Reba’s reactivity to the other facility residents, but she was still unable to be in direct contact with other animals. Reba’s sweet nature with people quickly made her a volunteer favorite. Our trainer taught her to carry a toy on walks as a means to calm her. Reba then became known for wanting to carry a toy at all times. I volunteered at the facility on a weekly basis and began to love my walks with Reba. On April 14, 2015, after almost 3 years in rescue, I decided to open my home to Reba for her remaining years. When we made the decision to bring Reba home, we knew it would involve keeping her separated from our own dogs at all times, but we felt compelled to do it. Since that day, Reba has become known as the “best dog” in our house, she’s so gentle and easy going. She has won over our entire family with her sweet personality and is a favorite snuggle buddy of my nieces. Reba has never had any issues making human friends; she loves everyone she has ever met and attempts to lick them all to death. With the help of our current trainer, Reba has transitioned into a dog that can go for walks around our neighborhood without being reactive to other dogs or animals. The positive reinforcement we have been using has brought her along quickly, hats off to our trainer and her expertise! At the ripe old age of 14, Reba is still a spunky and silly girl with a clown like personality; she consistently crashes into our dishwasher when running at top speed to go outside, and is well known for sleeping in until at least 9 am to get all of her beauty rest. She still enjoys carrying toys everywhere and is OBSESSED with tennis balls. She and my boyfriend spend quality time playing catch in the backyard. 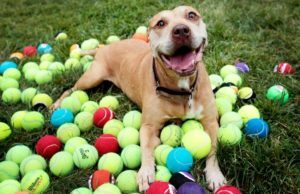 (Reba likes to gather all of the balls we throw into a pile and lovingly staring at her creation; she isn’t great on the fetch part.) She has us wrapped around her paw and she knows it, she gets no less than two bed time treats every night. Reba is quite the fashionista; her wardrobe includes sweaters to keep her warm in the winter and this year’s new addition of monkey pajamas. In June, we noticed a lump on her front right leg that seemed to come out of nowhere. In late August after a trip away, we noted that the lump had doubled in size. In early September, we took Reba to our local vet and were then referred to Oncology at the MU Veterinary College. The vet at MU, Dr. Reich, was absolutely amazing! 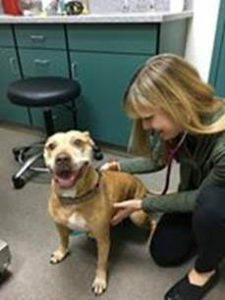 We left the appointment with confidence and the ability to make a good decision for Reba. UMDR supported us throughout the process including emotional support and financially covering the treatment as they do for all foster dogs. It turns out that Reba has a probable soft-tissue sarcoma. We’ve been told that these do not tend to metastasize, only 40% of a certain type do. After evaluating all of the options and recommendations, we’ve decided to forgo treatment as we feel that it would compromise Reba’s current quality of life. For now, Reba is continuing to run around the backyard every day like she has a rocket strapped to her back. She’s spending her days enjoying special treats and the comforts of home. Unfortunately, being a foster parent can sometimes rip your guts out. Reba is my 53rd foster dog and will be the second UMDR foster dog I lose to illness. We don’t expect her to go soon. If there is anything to be said about Reba, it is that she is resilient. Thinking about all that she has been through in her short life makes me realize just how wonderful her sweet personality is. We are well aware that Reba has now joined the ranks of our other forever fosters and we are ok with that; we’ve pretty much given up on her chances to get adopted at this point. As I was writing a similar note to all of the UMDR foster parents and volunteers updating them on Reba’s condition, I realized that even though I know where we are headed, I would do it all over again. In. A. Heartbeat. Being a foster parent means that sometimes your heart is full and sometimes it aches. When Reba leaves us, whether that be months or years from now, we will continue to foster for UMDR, we continue to believe in what UMDR does for each dog we rescue. Even though this hurts, I know not fostering would never be an option for me. 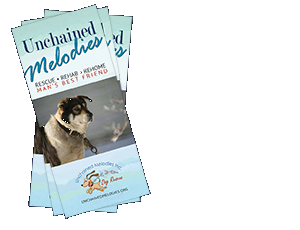 The commitment that UMDR makes to every dog they rescue makes fostering for them a rewarding experience. Even though we weren’t able to find an adoptive home for Reba, UMDR has gone to great lengths to ensure that she has had a quality life. We are looking forward to making our remaining days with Reba the best they can be and are also looking forward to whatever new adventure comes our way after. I am thankful to UMDR for their support of all dogs in their care, especially the forever fosters.